I ran out of okonomiyaki (Japanese pizza/pancake) mix a while back and I haven't been able to find one without msg again. My Japanese classmate told me I didn't need it and to just grate some nagaimo (Japanese yam) which you can get at Asian markets. This is aparently what happens to the nagaimo when you grate it. 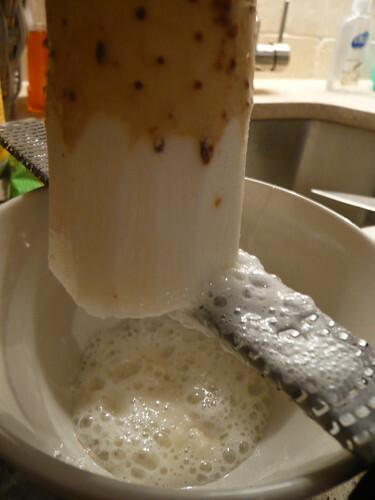 It is bubbly and gooey all on it's own. Lovely. I used this recipe for the batter with substitutes. I chose not to make dashi from scratch this time so I used water, soy and mirin instead. Fried up some panko since I didn't have tenkasu (fried bits of dough), and used ginger, rice vinegar, salt in place of beni shouga (red pickled ginger). 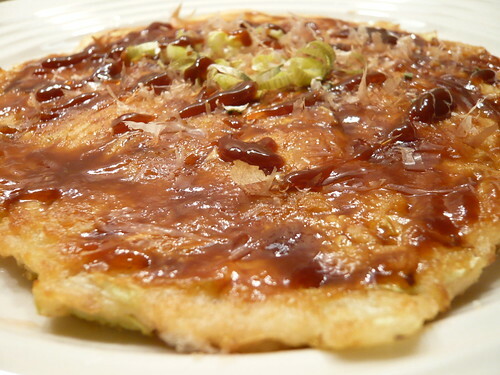 Made the okonomiyaki sauce as well with this recipe and topped the okonomiyaki with bonito flakes. The texture of the grated nagaimo scared me but the okonomiyaki actually tasted pretty good. 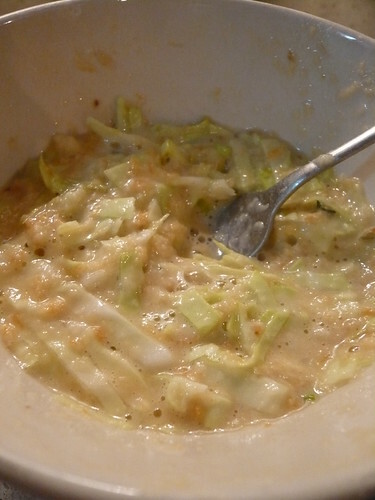 The texture was nice and smooth on the inside with a hint of the ginger and the sweet tang from the sauce. Next I want to try making a yakisoba sauce since it's one of my favorite noodle dishes but the packages in the store always have msg. My ultimate goal is to learn to make my favorite noodle soup broths. I got udon down (a basic dashi). Now there's pho and ramen, but I know these are way more difficult. whoa v, you are ahhhhmazing. you are making my mouth water. j: thanks! haha seriously. that's smart! gotta build up my recipe list. yes, please send em over! got to put my slow cooker to use!